Should my Colorist be Using Heat While Bleaching my Hair? If you're getting your hair color done at a new spot, and your colorist brings over a space-age looking heater, it could be totally okay—or it could be a recipe for disaster. Some stylists want you in and out of their salon as quick as possible, which is great for them, because the faster they get through clients, the more money they make. It's important to be informed about what the heater is doing, though, because there's a chance that your colorist's desire for that extra booking could be directly interfering with your desire for healthy hair. Before we get into the "why"s and "how"s of heating colored hair, it's important to explain some background info on how hair is processed. When highlighting hair or going a lighter color, a colorist is going to use bleach. Normally, it's a powdered bleach mixed with 10-, 20-, 30- or 40-volume peroxide. 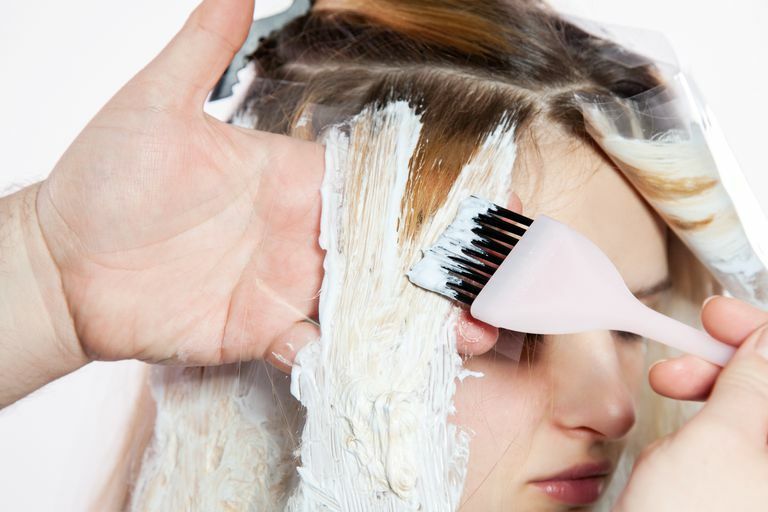 The higher the number of the peroxide, the stronger it is. A mixed bowl of bleach has a life of a couple of hours or more, although it may need a little refreshing. If bleach is applied well, it will stay moist up to one hour and will lift the entire time. So if your stylist is telling you that you absolutely need to go under the dryer or else the bleach won't process, it's probably a lie. All the heat does is speed up the process, but it causes some serious damage along the way by lifting moisture. You're at particular risk if your color isn't appearing light enough—it's easy for a colorist using a little heat to use too much. If that happens, after your hair is blown dry, all of the sudden you'll have a sea of "flyaways" at the top of the head. In general, colorists will say that the only time they use heat is if it's healthy, virgin, black hair, as it's hard to lift. Thin hair should never be put under heat, nor should hair that's consistently chemically treated. Anyone who can still see any effects of having hair bleached, permed, or chemically straightened, even once, should immediately bring up to their colorist that they're uncomfortable going under heat. Usually, a colorist won't force you, and if they're insistent on it, ask why they believe you need the heat, how long they intend to have you under, and how much breakage you should expect. Sometimes there's a good reason, like if someone's done balayage, and after 30-45 minutes the bleach is drying out. But even then, only five minutes or so of gentle heat is recommended. If you don't think it's best for you, make your colorist give you a good reason other than "it's faster." As the client, you should know that you have the choice between fast processing time or healthy hair.